WARNING: This article contains material which could drive you nuts. Okay not at first sight the politically correct expression expected from sensitive, right-on therapists such as Emily and myself. But in this case fully justified. For what we’re about to consider is a worldwide virus deliberately, cynically and yeah, even callously spread among humanity. And while this article runs the risk of further spreading the virus, it also contains the antidote which could benefit millions. Therefore read on … but with care. The virus currently concerning us is a mental virus about which you may already be aware. Until a few days ago I had never heard of The Game. Maybe that’s a generation thing, part of officially becoming an old fart. Maybe I should get out more. For those unware of The Game, its purpose is to forget about The Game, to avoid thinking about The Game. Thinking about The Game means you’ve lost … and you must announce it. That’s it. Those playing The Game understand in its most simple form it has just three rules. = Rule One – Everyone who knows about The Game is playing The Game. = Rule Two – Each time you think about The Game you’ve lost. = Rule Three – When you lose you must announce this to at least one other person. As a consequence people across the Globe, maybe walking down the street, travelling on buses, sitting in offices, whatever, can suddenly declare, “I lost The Game.” Then anyone within earshot also playing The Game has also lost. Mentally destabilising? Potentially if, as for some, it becomes obsessive. Downright daft? Too bloody true. Am I playing The Game? Not on your nelly! So why mention it? Two reasons. First to provide the way anyone infected with this mental virus can decontaminate themselves. Second, to explain how The Game was used to help a client dealing with a relationship problem. The mental virus which spreads The Game is based on what’s known as ironic processing. That’s a posh way of describing how, if you deliberately try to suppress a thought, you actually highlight it. 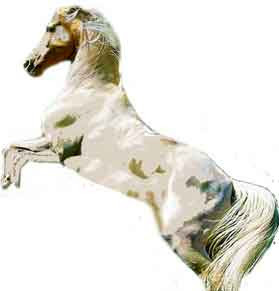 For example, for the next few seconds try really, really hard NOT TO THINK ABOUT A WHITE HORSE. It might have been more appropriate to have invited you not to think about a white bear; that what psychologist Daniel Wegner used during “thought suppression” experiments from which he coined the term ironic processing. What relevance is this to decontaminating those infected with The Game mental virus? Well by giving it a mental two finger salute. By realising you are not accepting Rule One, or Rule Two or Rule Three. I know about The Game but am not playing. I do not feel I have “lost” when I remember The Game nor am I going to make any utterances. My client with a relationship problem had been troubled by obsessive thoughts which, at an intellectual level, she recognised were irrational. But still they persisted, causing her pain and anxiety. She needed some way of adding emotional understanding to intellectual understanding. To find a way of understanding she could think about things without always caring or being concerned about them. She also had not previously heard about The Game but on learning about it had no intention of playing. She understood other people played, some might even be obsessed, but she did not care. She realised she had no need to care … and began to see the solution to her own obsession.